Purchase phpFox – leading social networking script. phpFox is full-featured social networking script based on PHP. Since release of phpFox Neutron (v4) script which replaced phpFox Nebula (v3) and has lot of improvements, it is now easier to use and manage and built on completely new platform that improves user-interaction and brings modern design instruments for site owners and developers. 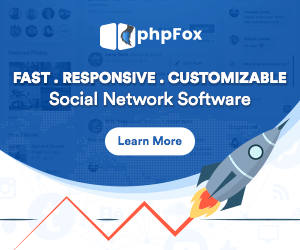 Start your online social network today with phpFox! Tons of custom apps to manage your social community even better. Use account privacy tool in order to customize how other users or guests interact with each other via their profile. You can easily like or unlike feeds with activity feed. Create your own Ad Campaigns. In phpFox your users can easily create ads using advanced ad designer. As an administrator you will manage system setting, make announcements, make ban filters, create user groups, post newsletters, provide an attachment support etc. With phpFox social network you can add as many public blog categories as you want. Using phpFox filters your users can easily find blogs they are looking for. phpFox CMS management is located in your Admin Control Panel under the Site menu. CMS management includes Menus, Blocks and Pages.